Welcome to the world of XtremeBrass technique. This guide is designed to be your "guide to success" in reaching your peak potential as a brass player. As with any road map, there must be a destination in mind. The destination for all brass players in the XtremeBrass world is developing the ability to play with a beautiful tone. That ability combined with a comprehensive understanding of brass technique will allow the player the opportunity to succeed in the art of making music. To me, the art of making music is being unencumbered by technical hurdles so that the performer can express and communicate freely their emotional involvement with the music they're performing. It is my hope that the information contained in this technique guide will bring to light the techniques that have enriched the lives of so many of my students and given them the opportunity to experience the joy of making music. With the understanding that "tone" is our priority let's proceed. First and foremost, it's important to know how to take a full, relaxed breath before attempting to produce a beautiful tone. It's also important to understand that "air" is the fuel of a great sound and without it a characteristic tone quality cannot be achieved. You must always remember "air creates tone" and your ability to inhale and exhale in a relaxed, unrestricted and efficient manner is essential in producing a great sound. Breathing - Breathing in a relaxed efficient manner is actually a very simple task that we do all day long without consciously thinking about it. Breathing is defined as the process of taking air into and out of the lungs. This process is an involuntary (subconscious) muscle action of the diaphragm and lower abdominals and is aided by muscles in the chest. For now, there's no need for you to understand the names or functions of the different muscle groups or get wrapped up in the scientific mumbo jumbo of it all, just remember your body breathes all day long without YOU thinking about it. From this point on let's refer to this involuntary muscle action as our "Natural Breath". The beauty of the "Natural Breath" is that it creates a relaxed, calm feeling throughout the body. All muscle groups become flexible, elastic and function with ease. This is due in part to the oxygen that the "Natural Breath" breathes into the lungs and eventually is absorbed into the blood. The oxygen in the blood not only aids in maintaining flexible muscle motion but also acts as a nutriment to promote muscle growth throughout the body. Simply put, your subconscious mind regulates your bodies breathing in an efficient and relaxed manner. Your goal as it relates to breathing, must be to learn how to exaggerate the "Natural Breath" so it becomes a voluntary or conscious process without sacrificing the relaxed physical condition it creates. For the most part, beginning and intermediate brass players over exaggerate this natural process causing themselves a host of problems. First off, exaggerating the "Natural Breath" will result in restriction and tightness in the lower abdominals, diaphragm and chest as well as constriction of the throat cavity. Tightness or rigidity in the lower abdominals (muscles in the lower abdomen) will impede the natural process of breathing by limiting the amount of air (oxygen) that you take into your lungs. Without the ability to completely relax the diaphragm you will never be able to take a full breath. Constriction of the lower abdominals will also negatively affect the control of air speed and pressure. This is detrimental not only to your breath control but to your pitch control and range. With only a limited ability to change your air speed and air pressure, changing the speed of the vibration of the tissue of the aperture will be greatly hindered. Thus, limiting your range extension and ability to alter pitch when necessary. I'll discuss more on these topics shortly. While discussing breath capacity and constriction I would be remiss in not talking about the condition of the upper body. Although your shoulders and rib cage will naturally rise while taking a breath it's wise to make sure that they both are relaxed. The shoulders should be naturally rounded, not pulled back to far or slumping forward before taking a breath. The upper body should be in a position that promotes expansion of the rib cage allowing the rib cage to expand and contract freely. If there is tension or constriction in the chest cavity or shoulders that tightness will limit the expansion of the lungs thus limiting the amount of oxygen you can take into your body. As you can see it is important to relate the action of breathing to the ability of taking a full breath because, "air" is the fuel of a great sound. Lastly, taking a full breath every time you breathe is of ultimate importance. 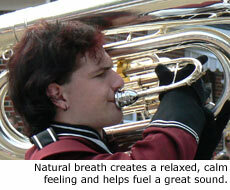 Breath Control - The next priority in creating a great sound is learning how to control the air you breathe. First and foremost you must learn that the lower abdominal muscles in combination with the position and shape of the tongue in the mouth cavity regulate air pressure and air speed. The more you exert the lower abdominal muscles in an upward motion the more air will be released out of the lungs. Conversely, the less exertion, the less air will be released. Air pressure is created when the air released from the lungs comes in contact with the back of the tongue before passing over the tongue through the oral cavity and into your instrument. The shape of the tongue in the mouth cavity plays a pivotal role in creating this pressure as well as controlling the speed of the air. The higher the arch of the back of the tongue the smaller the oral cavity becomes (the space between the tongue and the roof of the mouth.) Obviously, the smaller the space between the tongue and the roof of the mouth the more pressure will be created and the faster the air will be released over the tongue into the instrument. Conversely, the lower the arch of the tongue the larger the mouth cavity becomes creating less pressure with a slower speed of air. 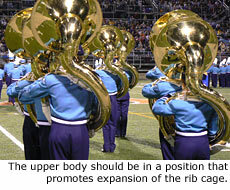 All professional brass players have learned to coordinate the motion of the lower abdominals with the motion of the tongue for complete control over their air pressure and speed. Once these basic concepts of varying air speed and air pressure are learned you are well on your way to understanding the concept of controlling the air you breathe. Pitch Control - Once you've learned how to vary both your air speed and air pressure you must understand how those functions affect both your tone and pitch. At this point it's important to understand the direct relationship between the frequency of the vibration of the tissue and the speed of your air. The faster the speed of the air passing through the lips the faster the tissue will vibrate producing a higher pitch, conversely the slower the vibration, the lower the pitch. You might be fascinated by the fact that the frequency of the vibration also affects the color of your tone. The faster the tissue vibrates on any given pitch the brighter your tone will be, the slower the vibration, the darker the tone will become. Once you've learned how to breathe in a relaxed manner, vary your air pressure and air speed you must understand that there is also a relationship between the speed of your air and the frequency of the vibration of the tissue with the size of your aperture. Realize that the speed of the air is not the only factor that controls pitch. The size of the vibrating surface (aperture) also affects the speed of the vibration of the tissue. Assuming a constant air speed is traveling through the aperture the smaller the vibrating surface the faster the vibration will be, the larger the vibrating surface the slower the vibration will be. Hence the sharper or flatter the pitch or the brighter or darker the tone becomes. Simply stated, accurate control of pitch and tone color involves a coordinated effort between the speed of your air, your air pressure and the size of your aperture (the vibrating surface). Assuming that you remember how to change the speed of your air using the lower abdominal muscles in combination with the position and shape of the tongue in the mouth cavity, the next step in the process is learning how to vary the size of the aperture. The Aperture - I like to create the image (for my students) of the aperture gliding along what I call a laser beam of air (the air column) in a forward or backward motion towards or away from the throat of the mouthpiece. The motion of the aperture is controlled by the muscles of the face and is accompanied by the corners of the mouth moving in a similar manner (much like puckering your lips). The motion of the facial muscles should be very elastic and smooth and the condition of the tissue vibrating should be very supple. You must realize that this type of motion not only changes the size of the aperture but its location in the mouthpiece as well. The closer the aperture is to the throat of the mouthpiece the larger the size of the vibrating surface, the further away the aperture is from the throat of the mouthpiece the smaller the size of the vibrating surface becomes. This movement should be thought of as a simple rolling motion. This motion will now serve as the technique we will use to vary the size of the aperture (the vibrating surface). To produce a well-centered pitch you must coordinate the speed of your air, your air pressure with the size of the aperture to create the frequency of vibration necessary. I would like to caution you that any unnecessary pressure from the mouthpiece (usually prompted by the hand) could impede the motion of the facial muscles and adversely affect your attempt to control pitch and tone color. Hand Pressure - The hands play a major role in regulating pressure on the vibrating surface (aperture). Careful attention must be paid by the performer to evenly distribute the pressure of the mouthpiece on both the upper and lower lips to ensure even vibration of the tissue. Uneven distribution of pressure will adversely affect your tone, pitch and flexibility. You also must understand the relationship between the amounts of pressure the mouthpiece exerts on the vibrating surface and the register (range) you're playing in. The higher the register the more pressure is needed and conversely the lower the register the less pressure is warranted. The hands must regulate these variations in pressure but at the same not impede the muscle motion. Please understand that the variation of pressure is slight but all-important. For all brass players with the exception of those who play French Horn the left hand is key in adjusting the amount of pressure the mouthpiece exerts on the lips. 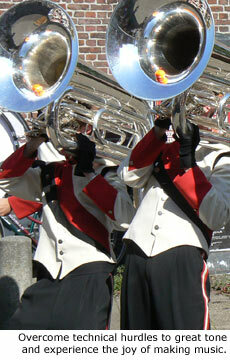 French Horn players on the other hand (don't mind the pun) control the pressure with their right hands. Please make a conscious effort not to use pinky rings or any other grasping aids on either hand to alter hand pressure unevenly. 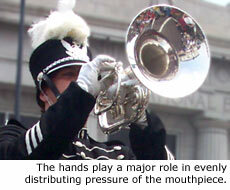 Pressure unevenly exerted from either hand could disrupt the equal pressure of the mouthpiece on the vibrating surface. In Conclusion - This approach to brass technique has been designed to create a coordinated system of muscle motion that is both fluid and unrestricted. The performer should concentrate on synchronizing the motion of the aperture, tongue, lower abdominal muscles and hand for optimal physical and tonal development. You must be aware of and memorize the physical sensations that occur when a beautiful tone is produced. You must strive to duplicate those same physical sensations repeatedly so your brain will learn to direct the muscle groups (muscle memory) to involuntarily direct the physical aspect of your performance to free your expressive and emotional self. Whatever you'd like to call this phenomenon, being in the zone or being on automatic pilot an incredible amount of dedication (hours of rehearsal) will be required to create that "natural sense" of muscle motion. The barometer of success of this method is without a doubt your quality of sound (tone). If the tone produced is not satisfactory then one or more of the elements of the system is out of balance and or being disregarded. The method relies on your knowledge of the system coupled with your ability to monitor your tone while making music. I hope you reap the same successes in your music making with my XtremeBrass Technique that the Blue Devils have enjoyed for decades. A) Hand Shape - See the "C"
Wayne Downey is music director of the twelve-time DCI Champion Concord Blue Devils Drum & Bugle Corps. Under his supervision as arranger and teacher, the Blue Devils brass section has been awarded the Jim Ott Memorial Trophy for "Excellence in Brass Performance" an unprecedented 21 times. Wayne was inducted into the Drum Corps International Hall of Fame in 1991. Being distinguished as one of the finest brass teachers/clinicians and arrangers in the world, Wayne enjoys an active teaching schedule in the capacity of arranger and musical consultant with the Tony & Emmy Award winning show "Blast", the DCA Champion Syracuse Brigadiers, as well as many fine high school and college programs. Known for his work in educational music publishing, his recent work includes "Dynasty of Brass," an educational DVD for teachers and students complete with performance examples and downloadable exercises. This product and other educational tools can be found on his website www.XtremeBrass.com.